Moscow -- U.S. national security adviser John Bolton has arrived in Moscow, where he is expected to tell Russian officials that America plans to withdraw from a historic nuclear arms treaty that dates to the Cold War. 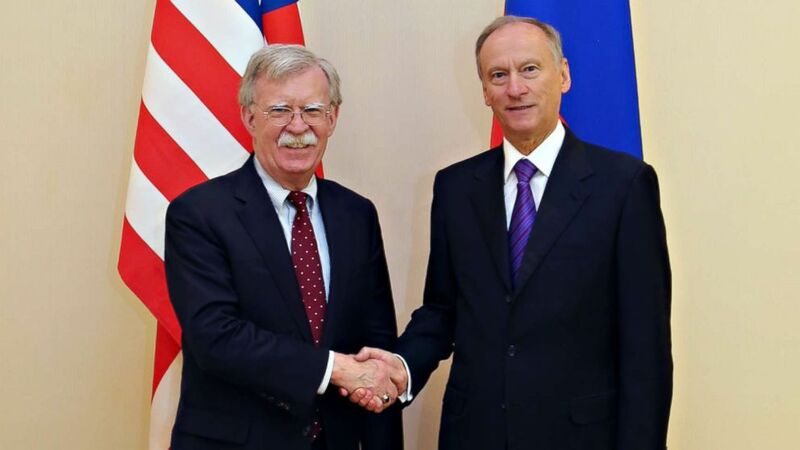 Bolton met on Monday with the head of Russia's National Security Council, Nikolai Patrushev, Russia's state news agency, RIA Novosti reported, citing Patrushev's press office. Later Bolton dined with foreign minister, Sergey Lavrov, with Russia's foreign ministry tweeting photographs of the U.S. delegation sitting at an elaborately laid table across from Russian officials. Bolton is spending two days in Moscow, and is due to meet on Tuesday with Russia's defense minister, Sergey Shoigu and later president Vladimir Putin. The trip is expected to be dominated by the Trump administration's decision to pull out of the Intermediate-Range Nuclear Forces or INF treaty. President Donald Trump announced on Saturday that the U.S. will withdraw from the INF, saying Russia is in violation of the treaty. The announcement prompted strong criticism from arms control advocates, as well as former U.S. officials, who have said it removes an important safeguard and knocks out a symbolic pillar of post-Cold War trust between Russia and the U.S. at a moment when they are already locked in confrontation. The INF was signed in 1987 by President Ronald Reagan and the Soviet Union's leader, Mikhail Gorbachev, at a time when the leaders of the two superpowers were seeking to put an end to decades of tension. The treaty bans the U.S. and Russia from deploying all ground-launched nuclear and conventional missiles with ranges of 300 - 3,420 miles. The agreement did away with thousands of missiles and was hailed as a stepping stone towards ending the Cold War. But for several years now the U.S. and Russia, have accused one another of violating the agreement. Starting under the Obama administration, the U.S. has alleged that Russia has been flouting part of the agreement by secretly developing and deploying a new cruise missile. On Saturday, Trump cited violations when he declared the U.S. would now pull out of the treaty. "They've been violating it for many years and I don't know why President Obama didn't negotiate or pull out," Trump told reporters in Nevada. "We're not going to let them violate a nuclear agreement and do weapons and we're not allowed to. We're the ones that have stayed in the agreement and we've honored the agreement but Russia has not unfortunately honored the agreement so we're going to pull out." Russia has long denied the U.S. accusations and has retorted by alleging a U.S. missile defense system in Europe also violates the treaty. Since Trump's announcement, Russian officials have criticized the decision to withdraw, saying it undermines the system of arms control that has regulated the two countries' relations. On Monday, as Bolton was meeting with Patrushev, the Kremlin's spokesman, Dmitry Peskov, said it would be seeking more detailed explanations from Bolton why the U.S. is leaving the treaty and "categorically" denied Russia is in violation. Peskov warned that Russia would have to take steps to "restore the balance" if the U.S. now began developing weapons banned under the treaty. Russia's foreign minister, Sergey Lavrov, ahead of meeting Bolton said that the U.S. so far had not triggered the six-month withdrawal mechanism that is built-in to the treaty. The Trump administration's withdrawal from the INF treaty is the first time the U.S. has abandoned a major arms treaty since President George W. Bush unilaterally exited the Anti-Ballistic Missile treaty with Russia in 2002. The decision has been met with a chorus of criticism from arms control advocates, as well as some former U.S. officials, who believe exiting the treaty frees Russia's hand while giving the U.S. little in return. Members of Trump's own Republican party have also expressed alarm that it could unravel the decades-old international system of nuclear arms control, calling on the president to renegotiate rather than abandon the treaty. "I hope we're not moving down the path to undo much of the nuclear arms control treaties that we have put in place," Bob Corker, the Republican chairman of the Senate Foreign Relations Committee said on CNN on Sunday. "I think that would be a huge mistake." Mikhail Gorbachev, who signed the INF with Reagan, condemned Trump's decision, saying on Sunday that "Washington has chosen the irresponsible path". Gorbachev said the Russian and the U.S. governments must still try to salvage the agreement. "I think that train hasn't left the station," RIA Novosti quoted him as saying.